Developmental Disabilities recently donated a handicapped accessible van to the Clark County Veterans Office. 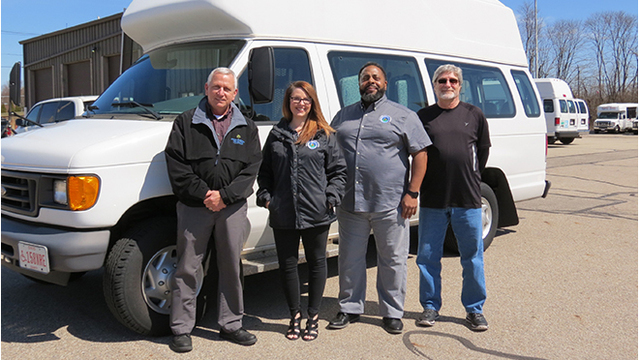 Pictured are (L-R) Bob Bender, Operations Director at Clark DD; Crystal Baker, Assistant Director at Veterans Office; Darwin Hicks, Transportation Supervisor at Veterans Office; and Jon Lyons, Transportation Supervisor at Clark DD. CLARK COUNTY, Ohio (WDTN) – Developmental Disabilities of Clark County announced Monday the donation of an accessible vehicle to the Clark County Veterans Services office. The 2007 converted Ford van with wheelchair lift will be used to help veterans with disabilities get to their medical appointments. Typically, the organization places surplus vehicles up for auction once they have outlived their usefulness, but Bender says that the van had such low mileage that he thought it would have more value to the community by donating it instead of selling it. “By transferring the vehicle from one county agency to another, not only will it continue to serve citizens, but it will maximize the life of the vehicle,” said Bender.